Southwest Healthcare Services and RehabVisions, welcomes occupational therapy services to Bowman. Available on Mondays, Wednesdays, & Thursdays, Ria Eaton, OTR/L, brings a great skill set to Southwest Healthcare Services. Eaton can do evaluations and service patients with a multitude of treatments that include exercise, hand functions, coordination training, sensory re-education, cognitive evaluation, low vision deficits, iontophoresis, phonophoresis, electrical stimulation, ultrasound, TENS, paraffin, splint fabrication, pediatric developmental delays, self care, stroke rehab. She can also perform home, wheelchair and ergonomic evaluations. Business Hours Monday through Friday 8 am to 4:30 pm. Closed from 12pm to 1pm for lunch hour. Originally from Lindsay, Mont., Ria grew up on a farm with her parents and one brother. 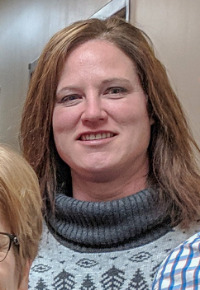 She currently resides on a farm south of Reeder with her husband and four children. She has a set of 11-year-old twins and a 9-year-old and a 4-year-old. Ria graduated from the University of Mary with a bachelor's degree in occupational therapy. Ria's passion is with orthopedics and geriatrics. When she's not treating her patients, she can be found baking, coaching, horseback riding, enjoying recreational sports and spending time her family. Ria is excited to get to know and treat the community of Southwest Healthcare Services.